It’s challenging enough to teach foreign languages to those who have never been exposed to them before, but it’s doubly hard when the teachers themselves are strangers in a new land. Five adjunct professors at Gettysburg College, however, are currently rising to the challenge as part of the school’s linguistics curriculum. We caught up with them to find out what their biggest challenges are, what they think about America as experienced through the prism of Gettysburg, and what their experiences are teaching them about being better instructors. Since as far back as her teenage years, Irene Monfort has had a fascination with foreign languages. Growing up in Alicante, a port city in the southeast region of Spain, she was fluent in both Spanish and Catalan, and began taking classes at private schools and other institutions to learn English when she was eight. It was her love for learning other languages that convinced Monfort to choose English translation and interpreting studies as her chosen field of study at the University of Alicante and, later, Nebrija University in Madrid. Still, it wasn’t until after she won a scholarship to spend a year working as a Spanish assistant teacher at the Atlanta International School in Georgia that Monfort knew without a doubt that she wanted to teach foreign languages to others. And, after applying for a job she saw advertised on her university’s email, she’s getting to do that right here in Gettysburg. Monfort is one of several adjunct professors from other countries who are currently teaching foreign languages to students at Gettysburg College via the college’s language studies program. Some, like Irene, are recent graduates with master’s degrees, while others are still in the process of earning their degrees. 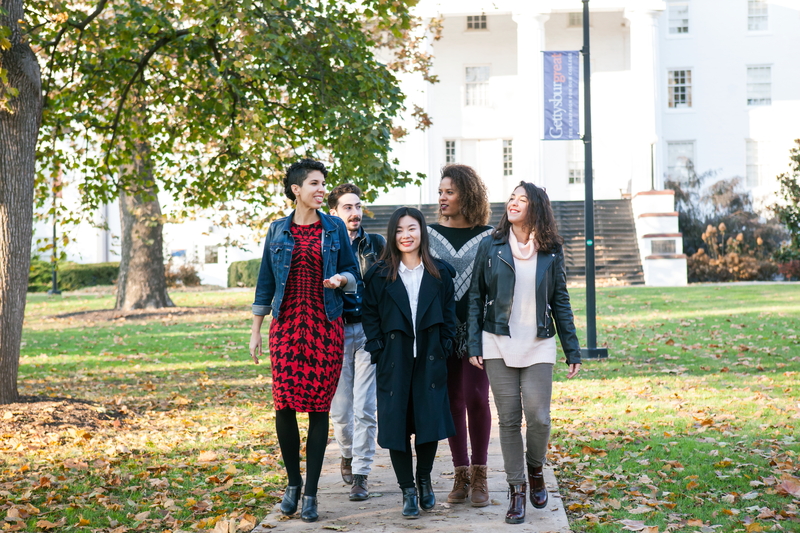 Most have had some kind of teaching experience before, either through their universities or via internships at other colleges, but for most, the gig at Gettysburg College represents their first exposure to the U.S.
For Zhifang Liu, a current master’s degree student at Beijing Normal University whose two semesters at Gettysburg College will satisfy the applied practice requirements of her degree program, the opportunity to come to the U.S. was especially attractive to her. While the opportunity to teach in the U.S. is exciting for the professors, it also presents a few challenges as well: Not only are these professors teaching languages to others, they are still learning one themselves. For Melanie Rubio, a master’s graduate from Granada, Spain, who holds a degree in language teaching and currently teaches Spanish at Gettysburg College, reaching her students through positive reinforcement is a commitment born out of discouraging lessons learned in her own studies. That’s why Rubio has made it a point to foster an environment in which students feel free to make mistakes and not give the right answers. “I try to forge an emotional connection students have with the Spanish language by creating a nice atmosphere where students do not feel threatened but supported if they make a mistake,” Rubio says, noting her use of “ice-breakers,” as well as video blogs, songs, ads, and YouTube videos to gauge her students’ interests and attitudes and bring the Spanish language closer to their personal lives. The other professors agree that such an experience can only be beneficial in promoting global awareness and fostering more understanding between different cultures, nationalities, and backgrounds. This has already occurred for one of the professors, who says teaching in a town like Gettysburg has broadened her understanding of the U.S.
Others agree, adding that such an experience for the professor can only mean better things for their students. At the end of the day, the professors say they realize that they’re teaching a lot more than just another language to the students of Gettysburg College. Thank you so much for the wonderful article. It was a pleasure to honor to be a part of this issue of Celebrate Gettysburg!